Supplies: Long skirt with stretch/drape. I loved the fabric of this skirt. 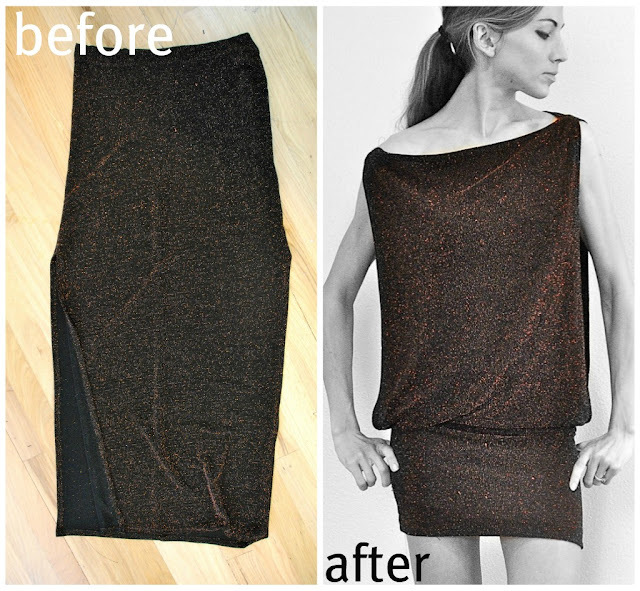 It had a pretty sparkle and stretch that would make it perfect for my drape dress. I thought it was a cute skirt so I figured it could still be both. DIY instructions: Get a skirt long skirt or 2 yds fabric. All I did was cut slits on both the side seams (24 inches up). Finished the edges of the slits. If you chose fabric the skirt measured 42 inches long. 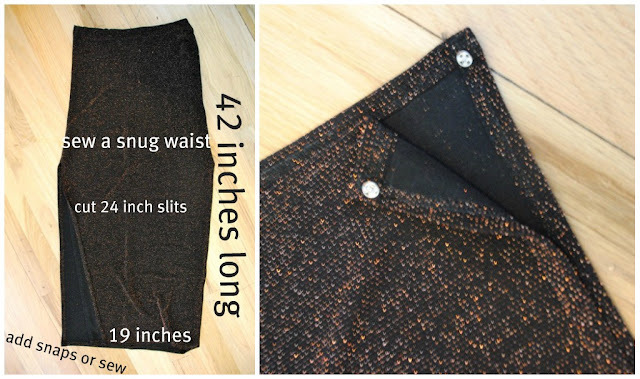 The bottom of the skirt was 19 inches wide front and 19 inches wide back (add 1/4 inch for finishing seams). I then sewed the top of the skirt tighter till I hit the slits...You want this to fit snug enough to create the fold of the bodice. If you want to do a convertible skirt/dress add snaps or any type of fastener at the edge of the slits (which is also the collar/sleeves for the dress). If not, sew them...I just sewed them and will seam rip them if I want the skirt. Add a slip underneath and done! This is such a great work! Your skills of reshaping clothing into something different are truly admirable!